There’s not much you can be sure of in 2018, like whether you’ll ever use your gym membership or stop binge-watching box sets, but what you can be certain of is what to wear, as fashion houses have already been setting out spring and summer’s biggest trends. From feathers to clear plastic, purple to polka dots, there were a wide variety of styles on display at London, Paris, Milan and New York Fashion Week. With loads of Christmas sales to choose from, here’s how you can get ahead with six trends to look out for when you hit the stores. Doing it and doing it so well. Every time the Spring/Summer shows come around, a new pastel palette takes over and this year is no different. If you want to be on trend in 2018 then it’s all about different shades of purple or Lavender to be precise. This shade is taking over from “millennial pink” as the next must-have colour and was shown in floaty dresses, structured suits and metallics from Michael Kors (right), Max Mara (centre), Dries Van Noten (left) and Erdem were all over this at fashion weeks across the globe. Britney Spears and Justin Timberlake called and they want their double denim look back. 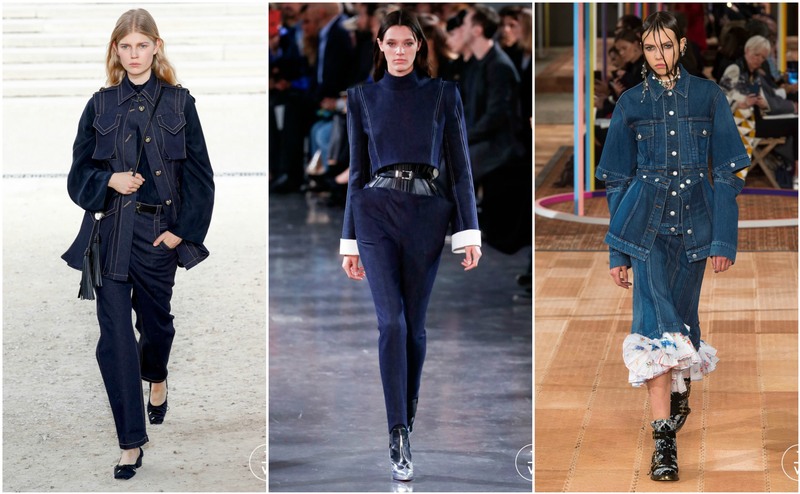 The fashion houses are taking a nod from 00s fashion with matching denim ensembles, this time in a deep indigo shade. The embellished and ripped jeans of the last decade make way for a more sophisticated and polished look with many thanks to Mugler (centre), Tom Ford, Alexander McQueen (right) and Nina Ricci (left) who all ran with look on the catwalk. Think Rhianna on the cover of ELLE UK October. This is a futuristic fashion trend that’s taking over from vinyl, which was all the rage last season. Trench coats, knee-high boots and handbags all made an appearance in shiny see-through plastic. I predict this might be the most practical look of 2018 – waterproof and easy to clean! One step ahead at Chanel (right) while Calvin Klein were big champions of this look, alongside Balmain and Marc Jacobs. Lets be honest, it is not the most daytime look, but if you’re looking ahead to a big event in 2018 then think fringing and feathers. This glamorous and dramatic look was spotted all over the catwalk and is already cropping up on the high street. You can be on trend without going all out by choosing a feather trimmed bag or skirt, or perhaps a fringed top for real lets-be-honest subtleness. This theme was big at Balmain (right), Loewe, Celine (left) and my favourite, Salvatore Ferragamo. Black on white polka dots provided a twist on a classic look at the Spring Summer 2018 shows. If there was one trend that works in all seasons it’s this one, so if you invest in a polka dot top or dress you can wear it all year round – which would be much easier than all of the above trends, lets face it. This is a look that took over from florals as the go-to spring print at fashion shows. Carolina Herrera (left), Jason Wu (centre) and Alexandre Vauthier all showcased this print. 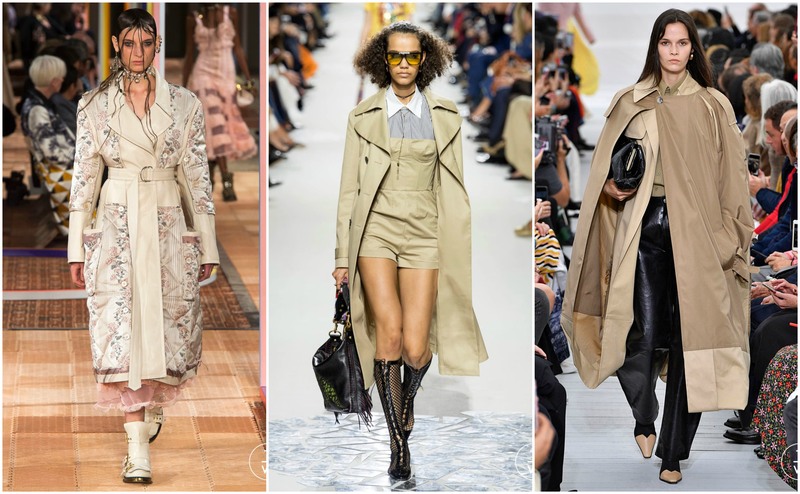 The wardrobe staple trench coat gets a refresh in 2018, complete with new cuts, accessories and embellishment, with that said, each designer interpreted the trench coat design differently, so there is plenty of styles to choose from. If you feel like updating your trench, you can add embroidery like Alexander McQueen (left) or Loewe’s feathering ideas. Dior (centre) played it well and added a matching playsuit underneath, whilst Phoebe Philo at Celine (right) complemented the classic design with a hint of red. This entry was posted in Latest News, London, Milan, New York, Paris, Trend Reports and tagged alexander mcqueen, Alexandre Vauthier, BBC News, Bottega Veneta, Calvin Klein, carolina herrera, celine, chanel, Chloe, dior, ELLE, erdem, fendi, jason wu, Loewe, Marc Jacobs Balmain, michael kors, Nina Ricci, Salvatore Ferrragamo, tom ford, Trends, valentino. Bookmark the permalink.